Regular readers may recognize Chef Peter from his bimonthly column on The Yum List ‘Sundays with Chef Peter.’ Finally a chance to meet this denizen in person! 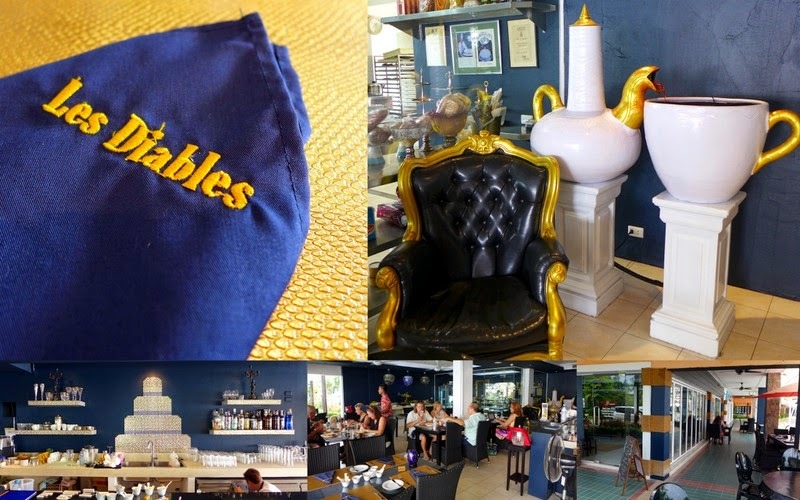 Table with a View of Boat LagoonLes Diables is hidden inside Phuket Boat Lagoon, right next to the old water market in a brilliant setting right on the boardwalk, so you can enjoy vicarious yachting dreams. Indoors the blue is more regal than nautical with glitzy touches of glittering chandeliers and gilt edges. Gentle strains of up beat music blend with the happy chatter of people enjoying their Sunday lunch. It’s a chilled out relaxed ambience that is perfect for hosting friends and family or just to escape a little from the busy-ness that can be Phuket’s main drag. We feel completely off the tourist trail, this is the inside scoop on a resident’s secret…. but something surely worth trying. 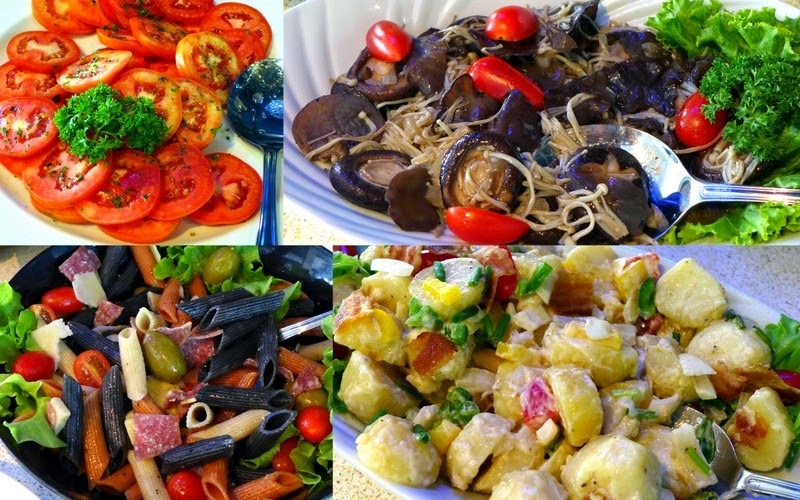 Sunday lunch is a splendid drawn out five course affair and we can see from the laden plates going past that we will be leaving with well sated bellies. 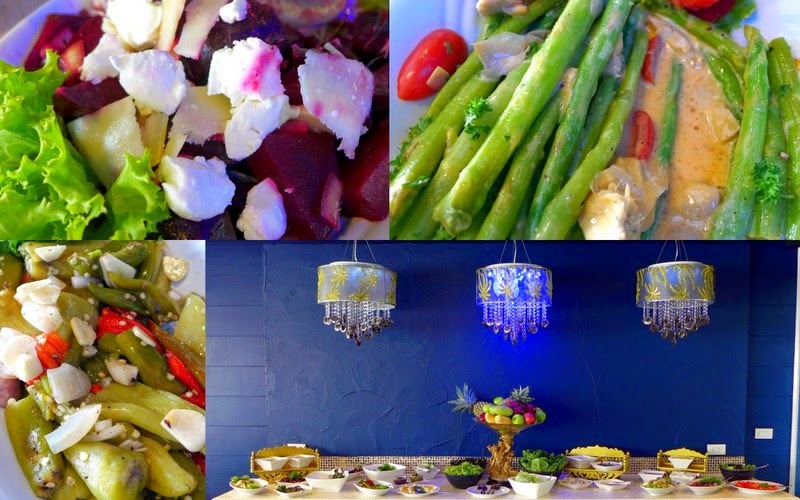 SaladsWe’re hungry so without delay we dive into the yummy sensation of vibrant fresh salads awaiting us buffet style. I pile on the colourful options before beginning to fork away. It’s all good, tri-colour pasta with porky bits, vies with buttery asparagus and two olive tapenades for my attention, but my tongue tingles most with the beetroot, Parmesan and soft cheese salad, which mingles marvellously with a rosemary dressing. Monica’s favourite is the delicate three mushroom ensemble and we’re both happy to see and taste bacon crisped by someone who knows how to do it. You’ll be spoilt for choice but you can pretty much just get a little of everything on your plate without being too greedy! From the Salad BarAs we munch on our salads, our smiling, charming host, Toon explains the strips of paper arrayed in small ceramic bowls. It’s the menu! We must make our choices and hand him the strips! Quirky. Much discussion and negotiation ensues about what the best taste balances will be, but we come to mellow agreement and are more than happy to be offered wine. 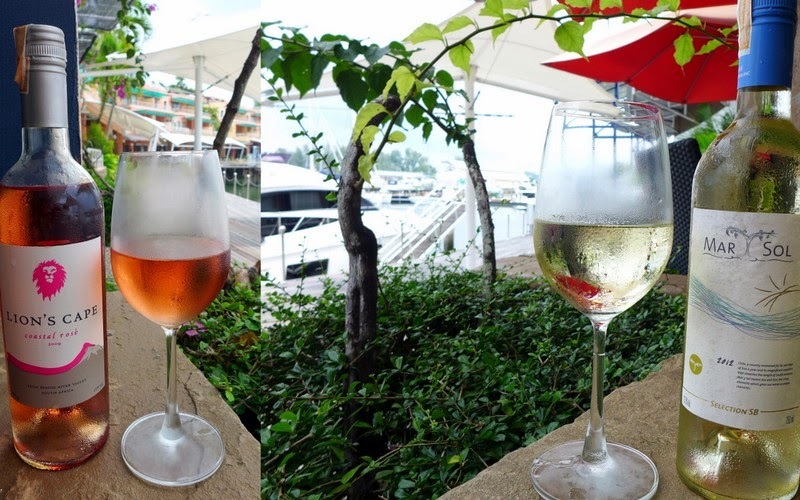 There are four options of wine by the glass, so that’s where we begin. Wine by the GlassAppetisersSpinach and Feta tart is so crumbly and more-ish, really packed full of deep green spinach with the sharp tang of feta crumbled through soft buttery pastry. Tuna Carpaccio is fresh dark and peppery, intense seasoning really draws out the meatiness of the tuna; it’s a simple dish but very tasty. We are happy that we made the right choices. Tuna CarpaccioSoupFrom a choice of four, we chose two contrasting soups. We agree that Gazpacho is a good idea in this temperature. This one is chunky and savoury and not too spicy. The Mixed Vegetable is a warm nourishing well blended combination; we can’t identify everything in the blend but are pretty sure we taste pumpkin, cauliflower, potato, carrot and more. It’s a slurpsome few spoonfuls in any case. Mixed Vegetable Soup‘Sweetie would you like more wine?’ asks Toon, and we don’t mind if we do. Time to try the two Chilean Reds on offer. First to my lips is the Red Mar Sol Carmenere 2012 (THB180), a medium bodied wine that carries fine aromas of red fruits and tastes quite smooth with a hint of spice. 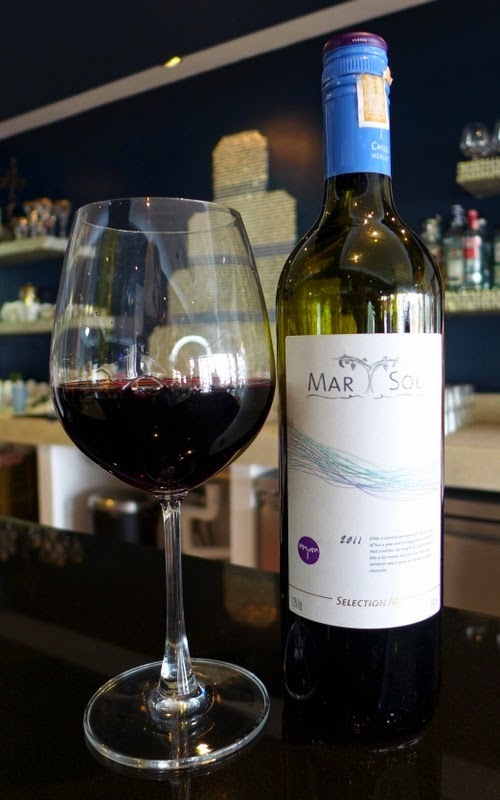 The Red Mar Sol Merlot 2012 (THB180) is a little more velvety in texture, well rounded and deliciously fruity with red berry dominating but little hints of chocolate in the body. Both wines are easy drinking for the price. Red Wine by the GlassMainsI congratulated myself on ordering Salmon Florentine when I saw how my neighbour was devouring it with relish. On arrival, steaming hot, I simply can’t wait to dive in. And mmmmmmm! The dish is opulent and luscious with lashings and lashings of smoky cheese mornay sauce over thick layers of spinach and superb sauté potatoes all topped by a generous slice of perfectly pink salmon that flakes on my fork and slips down very satisfactorily indeed. This one’s a Yum! Salmon FlorentineThe Roast Duck is likewise delicious but it’s the orange sauce that has us moaning ‘Oh my god…’ and Monica demanding for it to be bottled to take home. Intense orange gravy with perfect viscosity and little tiny fronds of peel, we could keep slurping forever. I discover what appears to be a tiny caramelised chutney/marmalade to the side and smear it on my duck slice for a taste of heaven. Roast Duck in Orange SauceGenerous bowls of veggies and potatoes accompany. Simply steamed mix of carrot, corn mange toute and cauliflower, some mysterious light spice giving a little more intrigue without over whelming. Pureed sweet potato and pumpkin is smooth and luscious, being perfect in its own spoonful or blended with sauce. Small sculpted potatoes are perfectly roasted, holding shape and texture but melting apart in the mouth. These are a treat to bite into individually, or to mash into the amazing sauce depending on your tastes. Veggies with the Roast DuckDessertsThis is what we have been waiting for since the moment we walked through the door and passed the chiller that literally groans with a range of temptalicious choices. 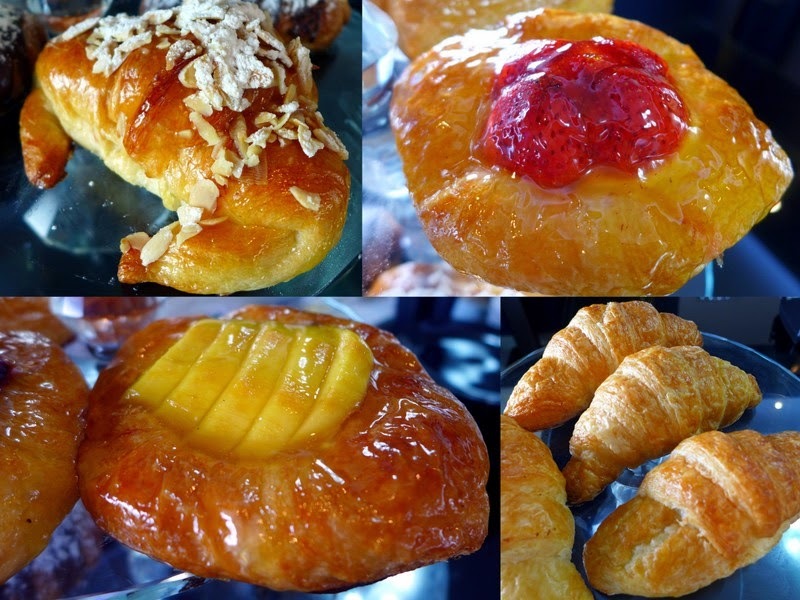 How, how, how to choose when you are told you can have whatever you like? Hmm… chocolate tart, strawberry tart, trifle, chocolate pudding, fruit tart, cheesecake, chocolate mousse… I’m torn, torn, torn between the lusciously piled strawberries that I know will contain a perfect crème patisserie, and the dark opulence of a chocolate mousse. Monica already has her heart set on a large slice of creamy looking cheesecake. Blueberry Baked CheesecakeThe Cheesecake is a divinely light concoction of thoroughly whipped cream cheese on a thick biscuit base. The tangy tangerine curd topping is meltingly more-ish and another taste that we think should be bottled for home consumption. Peter promises… ‘Eventually, when there’s time…’ Chocolate Pudding is a rich sweet sponge with a rich dark molten sauce, and it’s a huge portion after this already very filling meal. I scoop a few spoonfuls before conceding defeat. I have to take the strawberry tart home with me, and am happy to report that it makes an excellent light evening snack, juicy flavoursome berries, light cream and crumbly pastry. Yum!